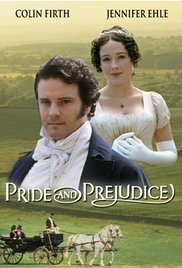 Pride and Prejudice (1995), (♦♦♦♦♦): I fell in love with this wonderful co-production from BBC and A&E channel. The dialogues sparkle with intelligence and humor, particularly the initial banter between Elizabeth Bennett and Mr. Darcy. Watching Colin Firth and Jennifer Ehle's exchanges, I would have sworn that the love between their characters was there from the very beginning. Lovely music, perfect casting choices even for minor characters, sumptuous estates, and great chemistry among the actors, make this miniseries pure perfection. 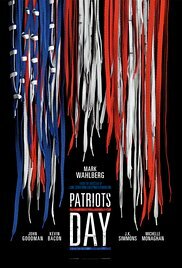 Patriots Day (♦♦♦♦): Based on the true events of the Boston Marathon bombing, this film encompasses the investigation, follows the survivors as they got urgent medical care, and follows the bombers as they run away in an attempt to reach NYC to repeat their heinous deeds. Patriots Day is a taut, edge-of-your-seat reenactment of the Boston bombing and its aftermath. Starring an all-star ensemble cast led by Mark Wahlberg, punctuated by sounds effects and round the clock action that impart urgency and give a "was-right-there" feel, this movie provides perspective on the things that matter most, and on the strength and resilience of the inhabitants of Boston and of the forces of law and order. Rogue One: A Star Wars Story (♦♦♦♦): the Empire is building a super weapon, called Death Star, which is said to be a planet killer. Galen Erso, the scientist in charge of building the weapon, has inserted a fatal flaw in the system and sent a holographic message to Saw Gerrera, leader of the Rebellion, so he can send men to neutralize the Death Star. However, Gerrera can only show the message to Erso's daughter, Jyn, before the city of Jedha is destroyed by a small demonstration of the power of the Empire's super weapon. The Rebels have given orders to Cassian, one of his pilots, to find Galen and shoot him, but Jyn's presence in his expedition frustrates his plan. When the Council cannot reach an agreement to send a group of Rebels to retrieve the layout of the Death Star from the archives, it will be up to a rogue ship, loaded with volunteer Rebels, to provide backup for Jyn and Cassian to steal the layout and broadcast it to the galaxy. While I was watching this movie, I kept thinking that the rebels wanting to destroy the Death Star was a familiar topic in the Star Wars saga, but I realized Rogue One was a prequel of sorts to Episode IV when I saw Princess Leia at the end deliver her line. 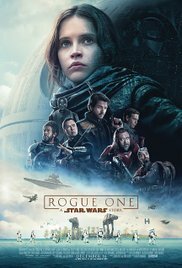 Rogue One is very entertaining and humorous, laden with special and sound effects, but with a solid backstory to justify them. It is also laden with memorabilia, as Princess Leia and the droids have small cameos, while Darth Vader has not so small a role in this episode. It is nice to know that there are more stories to be told from the galaxy far away that are not mere ways to show off the cinematic technical advances made since the franchise supposedly ended in 2005. I'm glad you liked Patriot's Day! I thought it was great too. It was quite a movie. I watched that adaptation of Pride and Prejudice when it was first shown in 1995 and I remember loving it too. I agree that the casting was perfect. I loved that BBC production of Pride and Prejudice so much I watched it a few times - and now I want to watch it again. Pride and Prejudice was released when my girls were both teenagers and we watched it together and all loved it! Then, we watched it again and again and again... It's a common experience that we still make reference to with certain Janeisms in our conversations, which always crack us up. It always makes to happy to hear of others who have loved that production, so thanks for making my day. The other night we watched Nerve. My notes say I learned about it from you. I thought it was great, husband was more reserved. Talk about timely! And it all worked: the plot, the cinematography, and the actors. Thanks for all your reviews. One of these days, maybe when husband is out of town for work, I am going to binge watch all the Star Wars movies again. Yes, Judy. Nerve was featured in one Snapshots. I'm glad you liked it. I binge watched the Star Wars saga years ago, and thought it was great. It has a Greek roundness to it that got me. With the release of the new installments, I feel that binge watching again is overdue. Love Colin Firth as Mr. Darcy, wonderful production of it. And hail to Marky Mark for his portrayals in true news event movies. Did you catch Deepwater Horizon?! Apparently Mark Wahlberg is the actor of choice for true events reenactments. Good for him; he does them well. I saw Deepwater Horizon, but wasn't crazy about it. One of the things that prevented me from really liking it was the excessive technical talk, which I didn't understand. But it was visually powerful, no doubt about it.